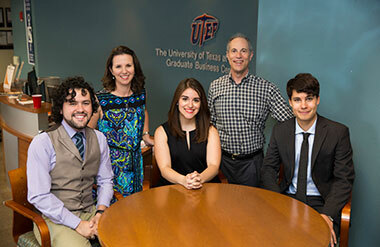 UTEP students, seated from left, Jorge Martinez, Daniela Noriega and Zach Jackson are the first B.S./MBA participants to earn their graduate degrees. The trio earned their undergraduate degrees in engineering in 2015. The program was started by Laura Uribarri, assistant dean for academic programs for the College of Business Administration, and David Novick, Ph.D., Mike Loya Distinguished Chair in Engineering and professor of computer science. They gathered recently at UTEP's Graduate Business Center, 201. E. Main Street, in downtown El Paso to discuss their experiences with the B.S./MBA program, which is in the process of expanding, and their future plans. "To be honest, I got more (out of it) than I expected," said Noriega, an El Paso native raised in Juárez, Mexico. The daughter of maquiladora operators grew up wanting to be an entrepreneur, so she was intrigued with the concept of starting her MBA as she continued her undergraduate work in industrial engineering. She earned her bachelor's degree in 2015. "I saw it as a growth opportunity," she said. "As engineers, we're used to solving problems, not writing essays," said Noriega, who begins work as an industrial engineer with Lockheed Martin in Palmdale, California, in September 2016. The program was supposed to save students money and time (about 18 months/18 semester credit hours by using dual credit), and make them more marketable. It started as a collaboration between the College of Business Administration and the College of Engineering's departments of Computer Science, Electrical Engineering, and Industrial, Manufacturing and Systems Engineering. They have since added the departments of Metallurgical and Materials Engineering and Engineering Leadership. The joining of the students has created a richer, more comprehensive discourse in the classroom, said Laura Uribarri, assistant dean for academic programs in UTEP's College of Business Administration, including MBA programs. "There's significant synergy there," she said. "It is a skill set that is becoming increasingly valuable," she said. "That's what we hear from our partners and that drives our interest. We see great value in diversity." That is among the reasons that the program expanded this summer to include nine degree plans from the College of Science. Preliminary outreach was done among biology majors during the spring 2016 semester. The plan was accepted by the Provost's Office during the summer. She said the college review board unanimously approved the concept because it already noted its success in the University's other fast-track programs that pave the way for more UTEP students to earn graduate degrees. "The University is a change agent," said Marcus, who said the College of Science has many potential B.S./MBA candidates. "The trend at UTEP and across the country is to merge disciplines." "You're constantly adjusting," said Martinez, a native of Mexico City who grew up in Juárez. "There is no real fool-proof method to follow. It's not something (engineering students) are exposed to." Martinez, who earned his bachelor's degree in electrical engineering in 2015, started his doctoral studies in marketing in August 2016 at the University of Arizona in Tucson. He plans to do research in modeling and strategy and eventually join the professoriate. For those who want to follow the B.S./MBA path, the trio suggested you enter with an inquisitive mind. They suggest prospective students attend UTEP's annual MBA Week, Sept. 23-29, 2016, at the Graduate Business Center. Jackson, who also earned his MBA this summer, said the program whetted his entrepreneurial spirit. He said what he learned went far beyond what he expected and he looks forward to using that knowledge. "Be curious and ask questions," Martinez said. "In engineering we're used to facts. We're not used to talking to people. This experience will help you establish relationships that you will need to survive (MBA courses), and then keep afterward." For more information about MBA Week, visit mba.utep.edu.